The Pre is small. Smaller than even the Treo Pro and even smaller than a Centro when closed. In fact, it's quite a bit smaller than I was anticipating it to be. Size-wise it looks to be a slightly reduced-size version of the original HTC Touch with styling cues taken from Motorola's "Pebble" dumbphone series. A Palm rep I spoke with compared the exterior to a smooth, rounded river rock. The device has a glossy exterior that is unfortunately quite a smudge reflector. The gently rounded edges are a nice touch and befitting with the "organic" feel of the device and its UI. I did briefly touch the device but all of the Palm reps were pretty protective and were not allowing people to did not hold it in hand for very long. I cannot comment on the slider feel but the action of the slider that I observed repeatedly seemed smooth and quick, without the coarseness found on Palm's older Tungsten T series sliders. I watched the device being demonstrated in landscape mode and the keyboard never snapped shut by accident (a frequent problem I used to experience on my T|T3). When the slider is extended the back of the exposed display ares hides a smooth reflective mirror surface. On what is usually a neglected area, Palm has thoughtfully put a large mirror finish surface that doubles as an extra large self portrait camera mirror or a convenient place for the ladies touch up on makeup. 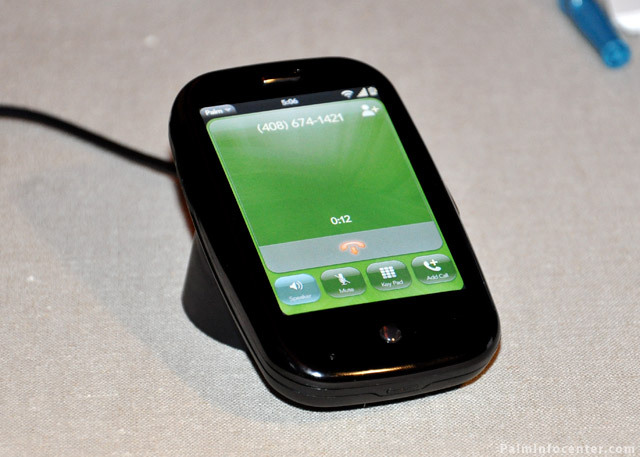 As someone who uses their device frequently for conventional "on the ear" telephone purposes, the pre appears to be extremely comfortable to hold and use, what with its angled with the HTC G1-inspired "bend" when the slider is extended. I am pleased to report that the phone can be used for telephony with the slider open or closed, though the Palm reps indicated it's far more comfortable to use with the keyboard extended, obviously. The front-mounted button is not a trackball, as has been speculated by some. It is a simple click-action multifunction "home" button analogous to the iPhone's central button. In another nice nod to usability, the button itself illuminates with a soft white light, as does the areas adjacent to it in the "gesture" area when certain actions are performed. 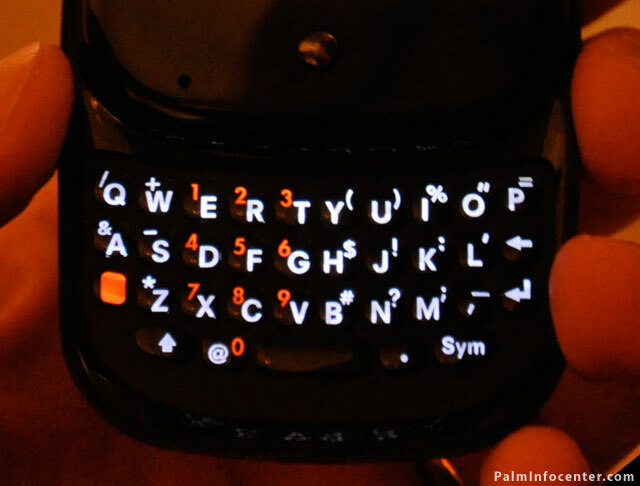 The Palm Pre's keyboard looks solid and elegant. 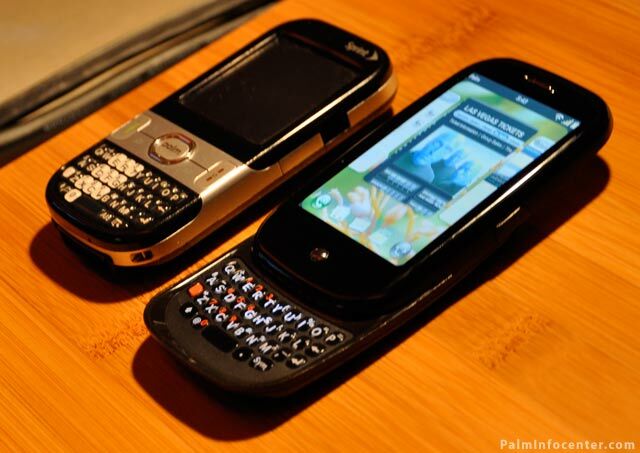 Hats off to Palm for engineering a "real" keyboard alongside a non-square screen form-factor. It's quite a pleasant surprise to find on a device with such sleek and tidy dimensions. Despite some earlier reports from elsewhere to the contrary, I am glad to report that the keyboard is almost entirely backlit aside from the spacebar. The color is a bright clear white with the letters lighting up and not the full keys as is common on the Centro. Speaking of the Centro, this device doesn't appear to use its single sheet keyboard design. The keys appear to be slightly raised and rounded, almost bulbous, and have nicely contrasting orange labels on the numeric keys and the shift button. The @ symbol has been being relocated to share space with the 0 key. A Palm rep explained that this was due to @ being a much more frequently used symbol than it was even a few years ago. The "menu" drop down button on the bottom right has been replaced with a SYM symbol button. From my close-but-not-hands-on scrutiny, the keys themselves are a little roomier than the Centro and Treo Pro but are not as spaced apart as the classic 700-series Treos. Thankfully, the vertical smile shape is retained but it's not as pronounced as on earlier models. There does seem to be a tiny bit of unused space below the bottom row of keys but this seems to be necessary to permit the slider to merge into the main body. Palm bills this LCD as possessing "rich 24-bit color" and measuring 3.1" diagonal in size. It uses capacitive touchscreen technology, unlike the resistive touchscreen found on every prior Palm device over the past twelve years. Regardless of OS, a Palm smartphone with a large portrait-oriented screen has been eagerly awaited for years and this one does not disappoint. While I'd personally like to have seen a physically larger screen sporting a few more pixels, Palm is now at least on par with their five-year old Tungsten T3 screen as well as Apple's iPhone. Pre's LCD displayed fantastically rich, vibrant colors with good saturation and nice black levels. A few windscreen videos played back on the Pre were devoid of any stutter or choppiness, and the fast action filled the screen from edge to edge. In future WebOS devices, I'd like to see a physically larger screen with more pixels, but at 320x480 is a solid step above the 320x320 squares we've been saddled with for far too long. An ambient light sensor is located on the front corner of the screen bezel, as is a proximity sensor to turn off the touchscreen while on a call to prevent battery drain and the dreaded "ear dial" phenomenon. After several maddening experiences with the BlackBerry Storm, I breathed a sigh of relief to see the Pre's accelerometer responding very quickly to changes in device orientation. One minor but fantastic use of the elegant integration between Accelerometer and OS in the Pre was shown to me by a Palm staffer using the photo app. Ryan and I were standing on the opposite side of the desk from the Palm rep . He said "Check out this picture of my friend" and handed the Pre to use, gripping it by the lower body area and turning his hand in a downward gesture as he "handed" us the Pre. So the Pre was at this point facing us with its top panel facing down and its keyboard "bottom" facing the Palm rep. The accelerometer immediately recognized the movement and inverted the picture so that we could see its proper orientation. In essence, WebOS anticipated the action and inverted the image on the X axis so that we could view the photo in its proper orientation. When he brought the Pre back towards him, the accelerometer flipped the image again and restored it to its normal orientation. To me, this was an absolutely stunning demonstration that could come in very handy for impromptu presentations and letting family members look at a photo without the fear of them handling your device and "messing something up". The side-mounted Micro USB port is covered by a small plastic flap. The device features full-speed USB 2.0 connectivity with its maximum theoretical data rate of 480Mbps. The port can be used for trickle charging as well as for modem tethering to a computer. The port also provides access to the Pre's sole means of data storage. 8GB of fixed internal flash memory is standard, of which approximately 7.4gb are available for user storage. In its current form, there is definitely no kind of removable memory card slot, despite Palm's legacy of providing expansion memory since the m505 handheld and the days of Palm OS 4. In my opinion, this is the Pre's single greatest drawback. A Palm representative told me that (I am paraphrasing his words here) "8GB is plenty of storage for anyone, especially since SDHC cards are really expensive and just now hitting 8GB capacities". This regrettable omission was made for both size concessions as well as to give the user more value and convenience, as they would not have to rush out to purchase an "expensive" flash card to use in their new devices. 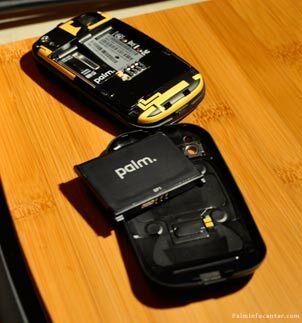 I personally would rather have seen Palm take a cue from RIM's latest devices and have 1GB of encrypt-able storage space onboard alongside the traditional microSDHC slot. With microSDHC readily and affordably available now in 16GB capacities and 32GB cards hitting the market soon, 8GB is too little for any serious multimedia applications, especially given the Pre's phenomenal screen, stereo headphone jack and impressively performing CPU and chipset. I spent some time talking to the staff at the SD Card Association booth the other night about the new SDXC spec. They are expecting to launch the format this fall with an initial capacity of 64GB with future cards going all the way up to 2TB. For Palm, an early supporter of the SD/MMC standard ever since 2001 with the m500 line, retreating away from the expandability and flexibility of removable storage cards strikes me as a very ominous sign of aping Apple's unfriendly attitude towards flash memory cards. 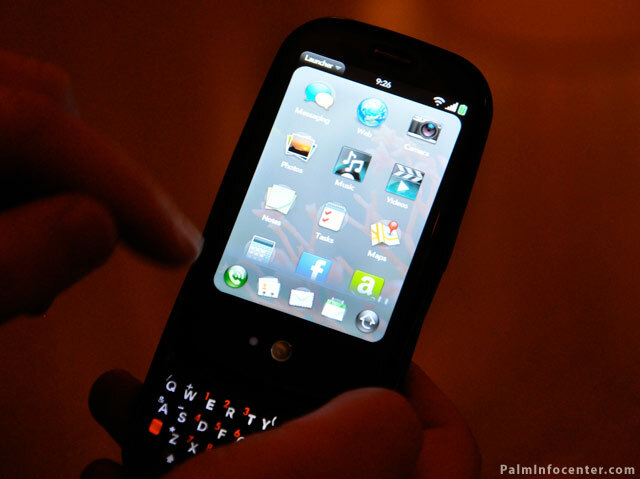 Palm has confirmed that the Pre's stock battery offers a 1200mAh capacity. Palm is really trumpeting the fact that it is removable and we've got the pics to prove it. While it appeared slightly different than the Centro/800w battery design, a Palm rep did state that the Pre could share those devices' batteries but it was not endorsed or recommended. While 1200mAh is certain to send chills down users' spines, we need to wait for Palm to make an official statement on battery life, as they were essentially offering 'no comment' at the show. The Pre's innards are comprised of the cutting-edge TI OMAP 3430, a very nice integrated CPU whose specs I will not bore you with here. In short, I remain absolutely blown away by the device's performance. Nearly no lag at all, and near-instantaneous screen transitions and redraws were seen all around, everything has a very snappy and fluid feel to it. And the capabilities of the Pre are just the tip of the iceberg, based on the stunning feature set available to the TI chipset. After over four years of battling with the inherent NVFS lag of various Palm OS devices, I finally have nothing to complain about based on what I‘ve seen so far. This thing is honestly Tungsten T3/TC fast, folks, even with a heckuva eye candy festival going on. Thankfully many of the traditional Treo cues remain on the Pre. The top-mounted ring/mute switch, while slightly downsized, is present and handy as ever. The volume up/down buttons are still on the left side of the phone but an unfortunate casualty of the new form-factor is the loss of the shortcut/multifunction button found on previous Palms below the volume keys. I'm also glad to report that the 3.5mm stereo headset jack found on the Treo Pro was not a one-off decision and appears here to much rejoicing. This was a feature heavily touted by Colligan onstage yesterday. The preliminary Palm Pre retail packaging lists a microUSB sync/charge cable in the box alongside an AC adapter and a stereo headset. 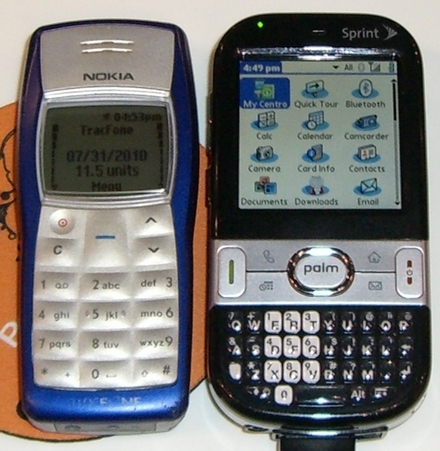 As you likely know already, a few stalwart features of every previous Palm device have been jettisoned in the transition to tis new era of hardware and software: the stylus, IR port, and hard application buttons and directional keys found on every device since the original Pilot are gone, in addition to the removable memory card slot and programmable side button discussed above. The back battery cover is replaceable and will require replacement if the optional and very cool Palm Touchstone inductive desktop charger accessory is used. I did not see a Pre being charged, so I cannot comment if there is a charge/alert notification LED built in the illuminated button area. I also did not notice a reset button under the battery door but I would assume that is just handled via a battery removal cycle. Given the superb stability of the devices we witnessed, hopefully this is a moot point. Please note that these comments are only from close examination of a brief fondling of one of the Pre-Pre Production device Palm is using here. Build quality in general seems exemplary and the slider makes the action of the old Zire 71 and the T|T series looks like shoddy stuff. One fantastic nod to Palm's traditional attention to detail is evidenced by the mirrored back panel on the rear of the unit that is exposed when the keyboard is pulled down. This wide reflective area has a nicely embossed Sprint logo and also serves as a fantastic way to frame yourself for self-portrait photos. Simple, classic and elegant and a nice touch that is "simply Palm". Continuing alongside the rear body of the Pre reveals a small 3.1 megapixel camera lens with a small LED assist lamp. Palm is touting this camera as offering "extended depth of field" capabilities via an onboard DSP but it remains to be seen how this feature can actually benefit the typical sub-par mobile phone image capture experience. Palm is saying the camera is for pictures only at this point and they won't say whether video recording is planned. This wraps up about every aspect of the device's hardware and form factor, based on many discussions, interviews, spec sheets and hands-on observations that I've been able to make over the past few days here at CES. We are going to try and meet up with Palm once more to field a few questions and will then be well-equipped to develop a thorough overview of the device's main attractions of the fantastic new OS and UI. You can find all of our Palm CES reports here and stay tuned for more continuing coverage. Ack. Making us wait till we can actually buy one of these is just mean! Thanks, Tim. it's a lot easier to do a hardware impressions write-up after just 2 days of the device and with zero hands-on time than it is to cover the OS & GUI. But I will be doing that next week after I've had some time to digest everything and pore over our collection of video and stills here. No kidding, just let me buy the damn thing already! 1) What's the holdup on Flash? Didn't they learn from the Foleo "No YouTube" debacle? 2) Do they have dev partners who will be announcing software pre-launch, as with Foleo? 4) Notepad limit?! Is there a true Memos app and can it do the 64K memos? 5) I can haz external Bluetooth keyboard? In fact, is there a Universal External Keyboard Driver already BUILT-IN to the OS? That's all I have for now, I think. Nice pics and observations. Incredible that it's small than a Centro! 2. Yes. There was a sizable list of partners (MOSTLY content ala mobiTV, not actual developers, though Dataviz was prominently shown on stage). 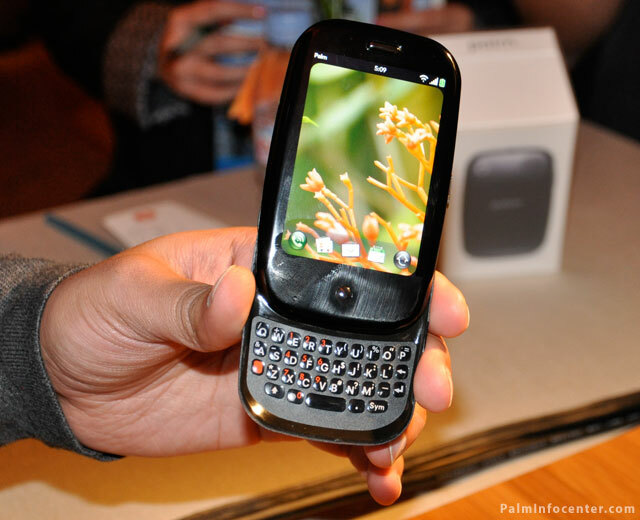 They said they are working hard with a number of their traditional partners to port their titles to WebOS. 3. See my earlier comments today (just look for all of my posts from today, Mike, as I posted quitie a bit of additional info re: memory limits etc). I'm in a bit of a time crunch here. 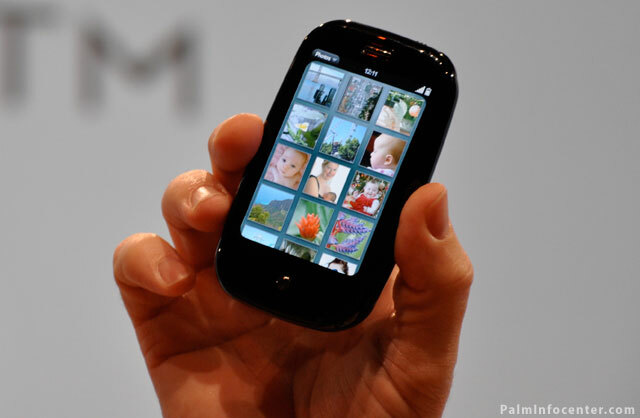 6. it appears Palm has given up on "powerhouse" apps. They said "most of the apps you'll need" can be done in tyhe web tool development. For "heavy duty games" the guy said they would "have to see what else they could do for developers to access the hardware directly". They said that games etc were not a priority, obviously. I don't smell a rat, personally. I just see...a retreat to a particularly focused niche of the market where EVERYTHING is lightweight and fluffy (storage capacity, the cloud storage metaphor, the packaging aesthetics, the devicve dimensions, the apps you'll run on these devices). Oh great. 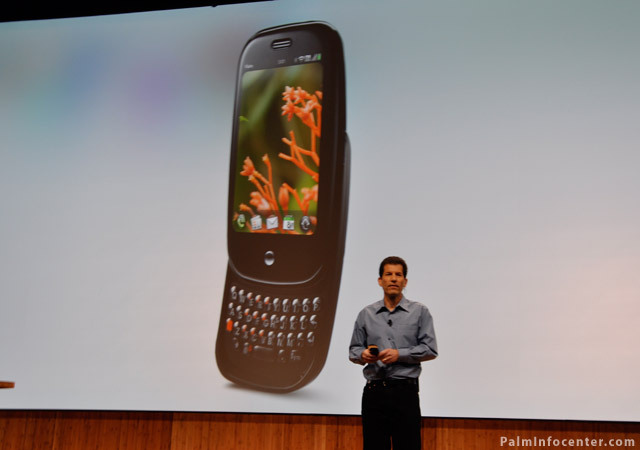 "The New Palm Pre: Less Functionality, But More FUN!!!!" I'll catch up on your other Comments later. Already swept through here once today to catch up since yesterday! "6. it appears Palm has given up on "powerhouse" apps." Maybe we should think of the Pre as simply not being a smartphone. However, even for a dumb phone, people demand games and media these days. I think the iPhone is actually a pretty lousy phone, but what makes up for that is all the games you can get for it. Not having a good game platform (or at least Flash and/or J2ME) is a serious omission. I can only see one vaguely productive app on either list (a weather app). If you're after a phone for playing games then by all means dip into your savings and grab that iPhone. It's not like we're in a global recession or anything. Most of the most useful iphone apps cost more than a few dollars and thus one would not expect the to be in the top 25 apps purchased by all users. 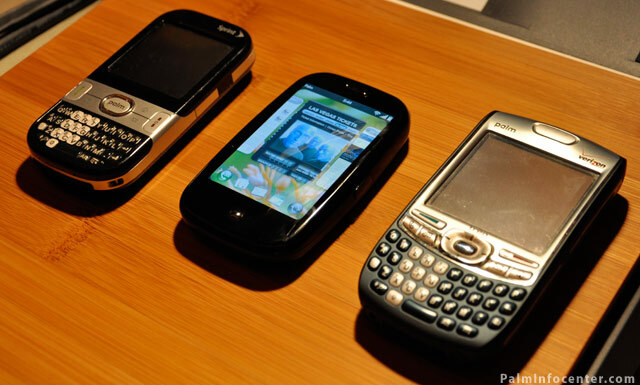 Ars has an article from an anonymous developer that has been using Mojo on the new WebOS. A major problem with the iPhone App store is that serious power apps can rarely ever make it into, or even near, the top 100 list. That doesn't mean they don't exist though. Soooo... iPhone's got powerapps (and potential for more powerapps) but few are using them. Yes, I've heard that one. Fits the profile of iPhone users I've met. Does it even read native MS Office docs yet (without conversion)? I think that was what Mike was referring to when he mentioned "powerhouse apps" in the previous post. "Soooo... iPhone's got powerapps (and potential for more powerapps) but few are using them. Yes, I've heard that one. Fits the profile of iPhone users I've met." Lots of people are using power apps on iPhone: games, real-time image processing, music synthesis, PDF viewers, etc. "Does it even read native MS Office docs yet (without conversion)? I think that was what Mike was referring to when he mentioned "powerhouse apps" in the previous post." Yes, there are apps that do exactly that. Tompi, you should have taken that reply a little bit further and noted that the apps on the iPhone App store are "number of units sold" ranked so something that costs 99 cents per unit, like "iFart", can easily exceed number of units sold compared to something like (made up name, sorry if it exists) iQuicken selling for $99. If you too said, "Who??? ", join the club! Whether or not I stick with Palm is going to depend on whether or not Dataviz ports Smartlist To Go to webOS. If I've got to buy a different program from a separate provider, rather than a discount upgrade, then I'm going to consider other devices, too. While I like the device, I'm a little disappointed that Palm is basically saying "None of your old software will work, and we can't tell you if a replacement will be available." I've contacted DataViz seeking a bit more detail on what they're working for webOS, hope to receive some more info soon. really great coverage. very complete and informative. I second that. It's so nice to have a reason to come back to Palm Infocenter. I'm really happy that you guys have stuck it out through the hard years to still be here when we need you. I'm very excited with the Pre. It's the phone I've been waiting for. I have to agree though that the 8GB and the lack of an expantion slot is a little disappointing, specially when I already have so much stored on my micro SD card. Say...how did you like how the phone part of the Pre worked!? ^^ Did you not notice the large, high-res photograph of the on-call screen in the article that you're commenting on, SV? There's lots of doubt out there from devs that anything substantial can be created using only HTML/CSS/Java. 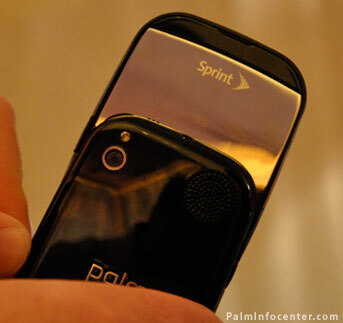 And looking at the Pre itself, wouldn't most of you agree that Palm isn't targeting businesses with this? This is for consumers, period, and only the WinMob devices are for the suits? Which makes Exchange server support an odd thing, doesn't it? I need to see devs announcing what they plan to release for this. I've seen lots of "useful" stuff appear as web apps lately, and palm NEVER said this was a consumer device. they said PROSUMER, so some business stuff thrown in is far from unusual here. that's how I see things. you think I'm wrong? well, that's the way you see things. Yeah, yeah, yeah. We're all on the same damned page of the 3 Palm kept citing: JS. Not let's get this sorted one way or the other, eh? I hope some third-parties start announcing what's coming! *Not let's = NOW let's. Damn, why do I keep making reverse typos like that? Why would I *downgrade* from my TX? I'm *really* disappointed with the lack of external storage capabilities on the Pre. I already have a very affordable 16GB SDHC card in my TX (courtesy of the brilliant Dmitry Grinberg's PowerSDHC driver) and would actually be giving up storage if I go to the Pre. I'm also concerned about this idea that all apps can be written in Web languages. What a waste of hardware if real software cannot be added on! Again, why would I downgrade from all the productivity apps (in multiple languages) that I can already run on my TX, which handles the online stuff (other than Web browsing) well enough already. RE: Why would I *downgrade* from my TX? I also think that Palm is trying to make the Pre more of an information manager than a media manager. They put a lot of effort into figuring out how to pull together information from various sources and put it on your phone. They seem to be aware that the Pre had to be capable in the multimedia space, but to me this looks more like a PDA on steroids than a multimedia machine. Hopefully we'll start seeing decent apps being announced for the Pre, as well as larger capacities, if this iteration looks successful. Outgrown their TX? I outgrew my T3 and I'm STILL awaiting a decent device that can at LEAST do everything the T3 can, but more. i wonder how i "sync" these? 1. How do you sync with Palm Pre? 2. If so can you add or remove files from your computer and it will sync with your hand held Palm Pre? 3. It seems (from the brief reading I did so far) it's NOT backwards compatible. If not, is there a way to transfer your main data to the Palm Pre? Just in case I lose my phone? (1) With regards to media - i.e. music, movies, photos etc - Pre appears as a generic USB mass storage device, so should sync fine with Winamp, WMP, iTunes (with the appropriate add-on software) or any other application that supports USB mass storage. Or you can just drag-and-drop files. This doesn't answer the question of how wireless sync would work though, something I've been wondering about myself. And PIM data, like contacts etc? We know it syncs over-the-air with online PIM services and integrates them all - which is actually pretty damn cool - but nothing about the desktop side of things. Which is a little worrying. Every video I've watched so far has the demonstrator trying a finger movement, it not working right, and doing it again. Sometimes multiple times. I think they need to refine this a bit more or that "Zen of Palm" reputation is going right out the door. Hey, it's all demo hardware and software, cut them some slack. You'd have a point if it was *on sale* like that, but it's not. And don't forget people can get nervous during demos. 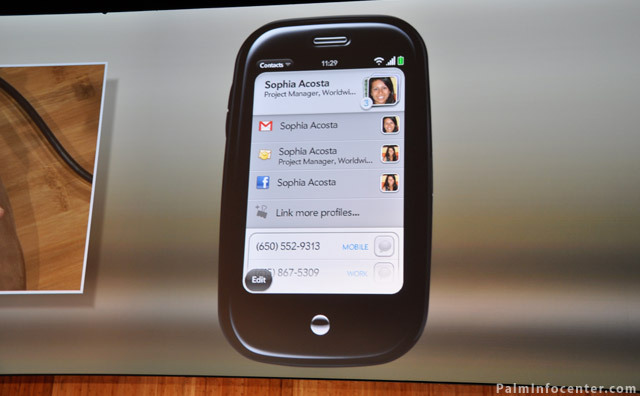 OR, given Palm's history, it's a hint at what's really coming. How many third-party apps were running on the demo(s)? Zero 3rd party apps were on the devices I saw, at least as far as I was able to discern. I mean absolutely nothing was on the devices other than the very generic 1st party Palm apps "phone, contacts, calendar, memos, tasks, calculator, photos, music, maps" etc. So I suppose that the "maps" app could be Google Maps or it could be a TeleNav app. Rubinstein (I believe) did say that the device would ship with 3rd party navigation software standard to utilize its GPS capabilities. Also, later in the presentation, I believe Colligan also commented on a Pandora employee telling him it took their guy only 3 days to port their media player client over to the Pre. Note: I didn't see a Pandora app/applet running on the Pre.